According to the political sociologist Robin Archer, “Labor-based political parties have been an important electoral force in every advanced capitalist country. Every one, that is, but the United States” (p. 1). Historians have been debating the reason for American exceptionalism on this score for decades. Perhaps part of the answer will be found in the history of the American Labor Party movement of 1918-1921, a movement that machinists from Bridgeport, Connecticut, led. They launched the first state chapter in the country in 1918. Where did this initiative come from? The context was World War I. 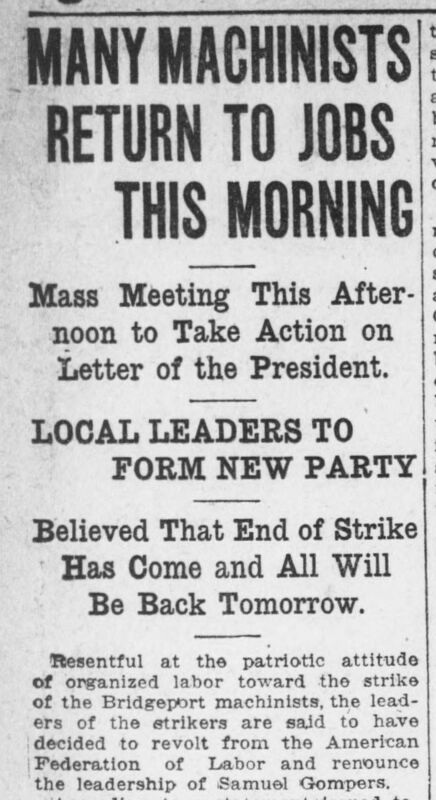 The International Association of Machinist leaders in Connecticut were upset with the lack of support from both the Democratic Party and the “pure and simple trade unionist” leadership of the American Federation of Labor for their war-time strike of the munitions industry. They marked the end of their work stoppage with the launch of a new political party with an explicitly pro-labor program and base. Historian Stanley Shapiro said of the Bridgeport activists, “President Wilson’s use of executive power to force the arms and munitions makers there back to work moved the strikers to enter politics in self-defense; the favorable settlement persuaded them that their prospects were good” (p. 410). More generally, the wartime bargain between labor and the state, which had included War Labor Board-sanctioned workplace committees and pay hikes, gave the most militant workers confidence that they could win a great expansion of democratic rights in the postwar period (Powers, p. 463). Inspired by the program of postwar “reconstruction” and industrial democracy promoted by the British Labor Party, unionists formed chapters in five Connecticut cities and then joined with activists from another fifty cities around the country to promote a national American Labor Party convention in Chicago in 1919. 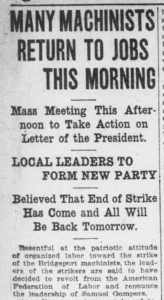 According to the news accounts in Connecticut newspapers, the party platform included the restoration of the right of free speech and assembly that had been abrogated during the war, the establishment of a public works program to provide employment to returning soldiers and laid off munitions workers, public ownership of public utilities, democratic control of industry, equal rights for men and women, and the abolition of the right of the government to declare war without a referendum of the entire voting population. The American Labor Party movement, formed at a time of a decidedly rightward shift in American politics as a whole, did not last long. Only in Minnesota, where a farmer-labor party endured, might the American Labor Party be said to have succeeded. Prominent supporters of the Connecticut party, the suffragist Josephine Bennett and her husband M. Toscan Bennett, were clearly disappointed by the failure of the movement. In 1921 they announced, with a national press release, their departure from the state to a different kind of experimental effort at economic justice, the recently founded Brookwood Labor College in Katonah, New York. To explore the topic of the American Labor Party of 1918-1921 in online Connecticut newspapers, go to http://chroniclingamerica.loc.gov/, click on the “Advanced Search” tab, select “Connecticut,” select the years “1918-1921,” and enter search terms in the boxes called “with the phrase” or “with ALL the words.” To explore the relationship between the Connecticut party and the national American Labor Party movement, or to see how Connecticut labor party leaders were covered by papers out of the state, select “All” states. Archer, Robin. Why Is There No Labor Party in the United States? Princeton: Princeton University Press, 2007. Fine, Nathan. Labor and Farmer Parties in the United States, 1828-1928. New York: Rand School of Social Science, 1928, pp. 377-397. McCartin, Joseph A. Labor’s Great War: The Struggle for Industrial Democracy and the Origins of Modern American Labor Relations, 1912-1921. Chapel Hill: University of North Carolina Press, 1997, pp. 144-146. Powers, Kevin. “Labor Parties,” The Princeton Encyclopedia of American Political History. Princeton: Princeton University Press, 2009, pp. 463. Rodgers, Daniel T. Atlantic Crossings: Social Politics in a Progressive Age. Cambridge, MA: Belknap Press of Harvard University, 1998, pp. 267-366. Shapiro, Stanley. “’Hand and Brain’: The Farmer-Labor Party of 1920,” Labor History 26 (3), 1985, pp. 405-422. Weinstein, James. The Decline of Socialism in America, 1912-1925. New York: Monthly Review Press, 1967, pp. 222-230.